Understanding polymorphism in liquids provides key insights into the complex nature of the liquid state, and may now be studied in detail as a result of advances in synchrotron x-ray diffraction techniques. The observation of a liquid-liquid transition in a material having two distinct liquid phases of differing density is experimentally challenging and requires simultaneous high pressure and high temperature conditions and instantaneous capture of the diffuse scattering from both liquid phases. Recent experiments carried out by Carnegie Scientists Yue Meng (HPCAT), Ho-kwang Mao, Jinfu Shu, and colleagues from George Mason University, Oak Ridge National Laboratory, and Tohoku University have now successfully identified a liquid-liquid phase transition in cerium metal. At 13 GPa, upon increasing temperatures from 1550 to 1900 K, a high-density liquid transforms to a low-density liquid (Fig. 1), with a density change of 14%. 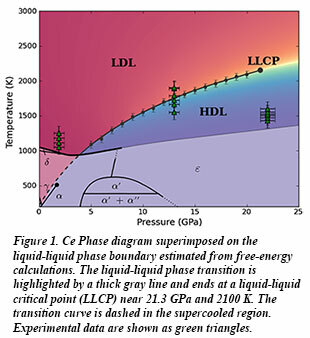 Theoretical results suggest that the transition is first order and terminates in a critical point (LLCP). Computational work further points to the delocalization of f electrons and a fluctuation in the valence state of the Ce atom as the origin of the transition to a low-density liquid state at at high pressure and temperature. [A. Cadien, et al., Phys. Rev. Lett. 110, 125503 (2013)].